Greetings from Musoma, Tanzania. After a year of being here, I have learned that no matter where I go, I will be home and create a community where I feel supported and loved. I am grateful to God every day for this opportunity to be challenged, to love, be loved and be in service. My service continues at the vocational training center that serves young women who are at risk (HIV, abuse, single mothers and disabled). We have 15 new students for the first year, and more keep coming. We have created a couple of new classes and remodeled a room to create an art room. We added art and English classes. Students are learning about watercolor, shading and forms. We make cards to sell, which gives them a chance to explore their creativity and learn new skills. We also added an English class and are experimenting with something new. My friend Darcy Rogers is helping us learn how to teach organic language acquisition methodology. I am surprised at the willingness of the students to try something so different! We are having fun, but have also had challenges. For example, I had no idea how I was going to teach deaf students together with the other students. Now we are learning sign language at the same time we are learning English. It is such a joy to see the students who are deaf teaching us how to communicate with them. For me, coming to St. Justin every Wednesday is coming to a sacred place, where all sorts of children, young and older, are living together. Here in Tanzania, the disabled are disregarded by their families and by the government; there are no special services from the government or any support for them. At St. Justin, there’s a lot of love and hard work. My hope is that we get some funds to help them with a long list of basic needs such as clothes, shoes, mattresses, water pump. There are 75 students at this center, and each of them is a loving person. 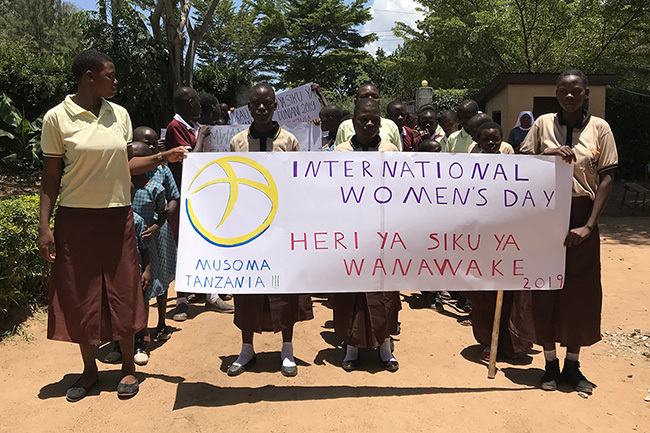 On March 8, several Maryknoll Lay Missioners women’s ministries in Musoma jointly celebrated International Women’s Day with a march, songs, dances and lots of good food. We celebrated International Women’s Day with three organizations. Over 180 students carried placards and sang, followed by a performance by the students, lots of dancing and of course special food for the day. As I was taking pictures of the parade, I thought about the lack of women’s rights in Tanzania society where some children are forced to marry at a young age, some young woman are forced to be circumcised and have to run away to places like the Jipe Moyo shelter where fellow lay missioner Liz Mach works. Here mute and disabled kids and young women have no help from the government so they have to go to a program like St. Justin. Only a small number come to the Rosemiriam Dagg Center to learn skills to support themselves. We have no space or funds to run a bigger program right now. However, as I look at the students from these three organizations carrying placards, performing, singing and dancing, I know that there is hope for the future of these young women and men. A small child beams with joy as she reads a picture book at St. Justin Centre for Children with Disabilities. 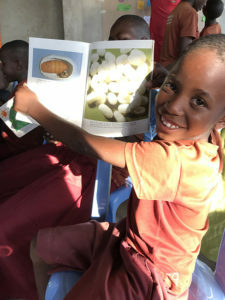 As I continue my ministry here, I am reminded of how precious each day is, as I see a young woman learn English and kids laugh so much when we are together, as I spend time with sisters who need some help with exercises or hold the book for the young girl who can’t hold it. I am grateful for this opportunity to continue my journey deepening in my faith. Angelica Ruppe serves women and children at risk or with disabilities in Musoma, Tanzania. She invites people to like the Rosemiriam Dagg Center at facebook.com/dagg2012. Donations to her ministry account can be made at her fundraising page. 2 Responses to "Musings from Musoma"
Buen trabajo Angelica, sigue adelante con el magnifico trabajo que haces! this is great. It was so nice to see you Angelica in Tanzania last year. Que sigues con compassion y alegria en este trabajo !